Have a look. It is fully automated and includes IOTA Peer manager, password protection, monitoring and graphs! So I tried installing using the click-n-go method, OS Requirements say Ubuntu >= 16, however using Ubuntu 17.04 appears to fail. Trying using installation instructions now. just thought i'd shoot you a heads up. Thanks for the heads up. I will have a look at 17.04. tbh I fully tested on 16.04. Hello, I've tested version 17.04 and removed the limitation that was on the script. It now accepts both 16 and 17.
i didnt find iri.ini to put the neigbors inside???? I've added iri.ini recently though in this installation it is used for some extra options. 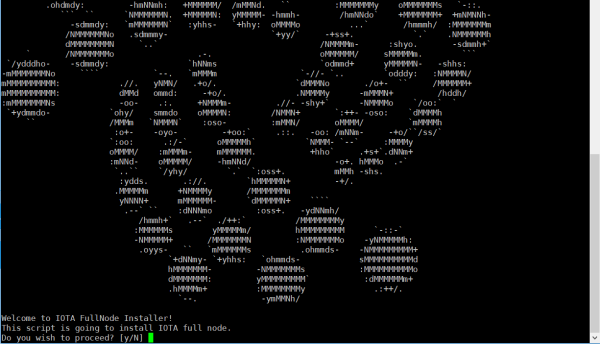 Hi all, I've configured the iri-playbook (automatic installer) to allow installation of individual components. Its possible that you integrate nelson ? and auto update function? Nelson is included, but not installed by default as it is still in beta. I think it is too early to add an automatic update. Update of nelson is quite easy (one command). I believe that at this stage it is better for people to be aware when there is an update, as updates might change functionality or the configurations considerably. I Started the Script an got the IOTA sign. Welcome to IOTA FullNode Installer! This script is going to install IOTA full node. I have heard of others that had the same, seems that in some situations the bottom most lines are missing. How are you connected to your server? SSH? If so, with which SSH client? Aha, I know what happened there. Can you try the above command and see if that fixes the issue? If so, I will add it to the docs. Fixed in this commit, applied in docs.